The end result is a safe and gentle living environment, free from unnecessary stress at this time in the resident’s life. Our vigilance and dedication to personal human touches, which unfortunately to often is overlooked in the larger care facilities, gives Aging Grace a very significant advantage in our approach to the care of our elders. The true bottom line is respect, sensitivity and rapid action in attending to the needs of all of our residents, regardless of their medical situation. Measurement of our success comes from the feedback we receive from families and residents, which consistently returns to us in complements on the level of warmth and nurturing which is observed daily. 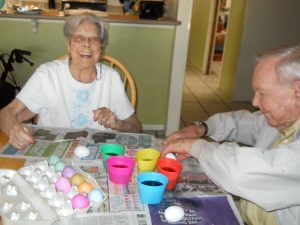 Aging Grace is licensed by the State of Arizona as a 10 resident directed care home which is operated by Aging Grace LLC, an Arizona Corporation completely owned and led by local Tucson based leadership (not Big Corporate people back East). We formed Aging Grace in late 2013 to deliver urgently needed family setting care for our “assisted living” elders in the community. Our superior management team has many years of adult home care, health care and business experience to ensure efficient and affordable care. Our caregiver team has extensive professional backgrounds in Senior adult care, Elderly assisted living and memory care. Each member of the Aging Grace team is state certified, fully trained to our unique FocusCare™ model and expected to conform to the highest standard of resident care possible. This team performance pledge (in writing) is expected to be carried out in each resident and family member each and everyday. In summary, our Philosophy and Pledge to service our residents is so much more than what can be written about on this website! We suggest you schedule a visit and arrange a personal tour with the manager by one of the methods below. Then you can truly experience our promise at Aging Grace to strive each day to exceed the expectations of our residents and to offer family and friends of our residents the assurance of the highest quality care, a safe and peaceful environment, with healthy affordable living at it’s best.